The running schedule is occasionally subject to change, so you are advised to check our members’ Facebook page on the day of the run to confirm details. 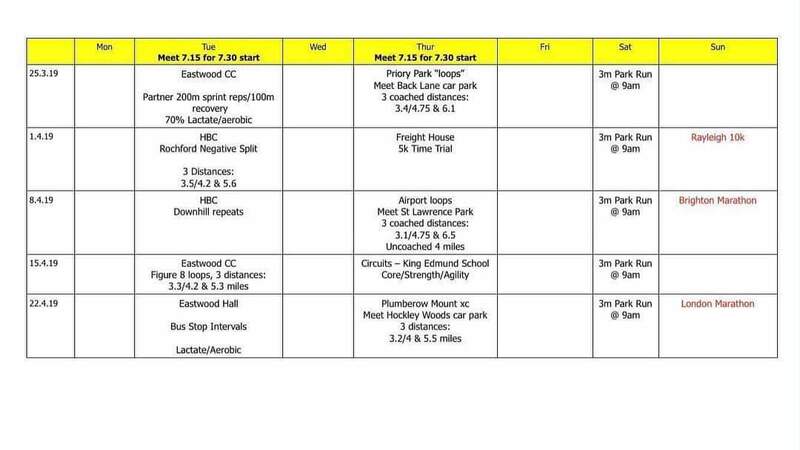 LONG RUNS: Every Sunday morning organised between Club members. See Facebook for more information. Where the meeting point is shown as ‘HBC’ this refers to Hawkwell Baptist Church, Rectory Road, Rochford. There is a free car park adjacent to the hall. All we ask is you have consideration for the local residents when you are parking on any of the roads and not cause any obstruction. Where the meeting point is shown as Eastwood Hall this refers to Eastwood Community Centre, Western Approaches, Eastwood. Park in Morrisons car park.